Ceiling fan is one of the most common appliances in Indian household. 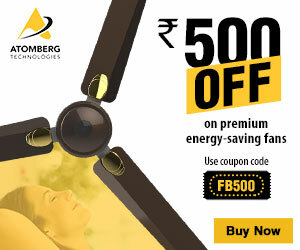 Being a tropical country, India relies a lot on ceiling fan and there is a ceiling fan in every room in the country. When we go and buy a ceiling fan, we also get a regulator along with it. 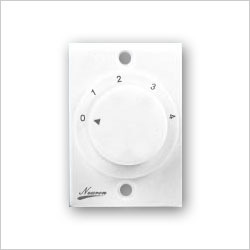 Regulators are of different types, and different ceiling fans come with different types of regulators. Most people typically do not care about the regulator, but it is very important to know that even the regulator can waste electricity and can increase your electricity bills. Good news is that you can always refuse to take the supplied regulator and can get equivalent discount, and replace it with an efficient one. But for that you need to know about the types of regulators. A ceiling fan has an electric motor and metallic blades connected to it. When we switch on a fan, the voltage difference causes the current to pass through the motor and the fan rotates. 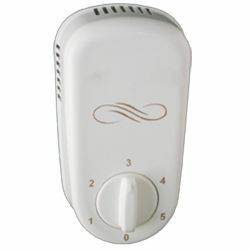 The regulator controls the voltage that makes the current flow less or more. Lower the voltage lower the speed of the fan. So a regulator controls the voltage levels for the fan. Traditional regulators that were there in our homes in the past were mostly of this type. These regulators have resistors to decrease the voltage for the ceiling fan. The resistor heats up while decreasing the voltage and thus the electricity saved by reducing the fan speed is lost as heat in the regulator. The internal heat also damages the regulator in long run. These regulators are also bulky in size. They come for as low as Rs 40 a piece. Movable Type: These regulators move smoothly and there are no stepped number (1 to 5) provided on theem. These regulators are better than electric ones but still can cause some distortion to the movement of the motor that causes it to heat up. This type typically costs Rs 100 apiece. Step Type: These regulators have numbered speed steps (typically 1 to 5). These regulators provide lower distortion to the movement of the motor and thus less heating. These are the most efficient type of regulator. This type typically costs Rs 200 apiece. 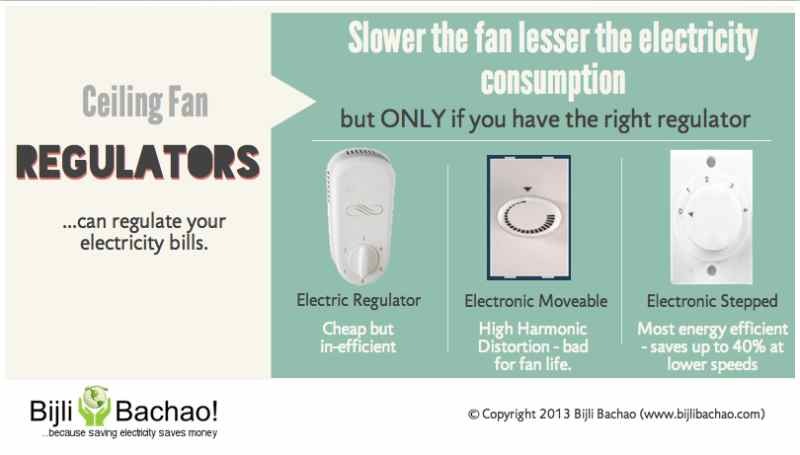 If you run fans at low speeds in your house then a step type fan regulator is the best electricity saving option for you. Savings in electricity bills can recover the extra price you pay for it.